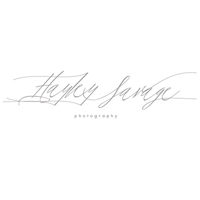 Just wait till you see the table plan – they had cute little photo’s of every single guest printed and fixed to an envelope. The guests had to spot themselves and then open their envelope to find out where they were seated… What a great way to get everyone mingling, and what a great conversation starter. Also – I LOVE the table names. Pure genius, check them out. I’m going to go off for a little sulk, but I will leave you in the capable hands of Victoria, who will reveal the story of her big day. A story perfectly illustrated with images from Andy Squires. 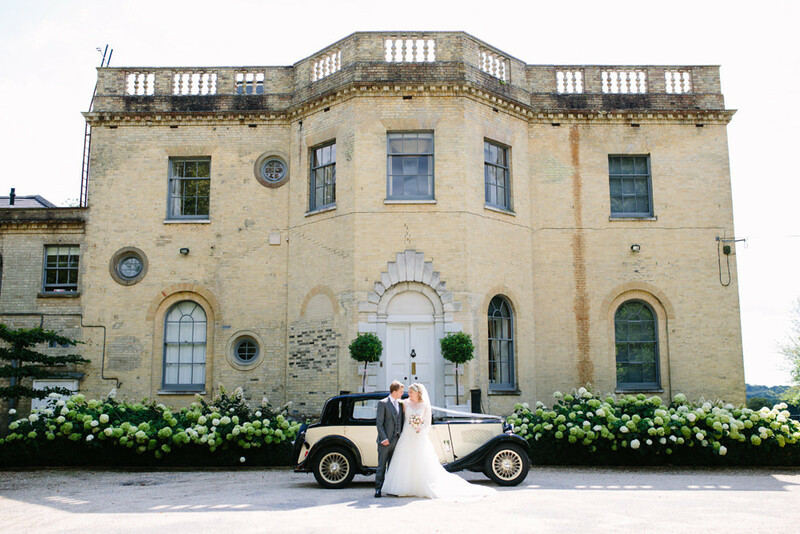 We got married on the 1st October 2011 at the gorgeous Hill Place in Swanmore, Hampshire. Our wonderful and generous friends Will and Rebecca, who were able to be guests as well as hosts at the wedding, own this gorgeous venue. 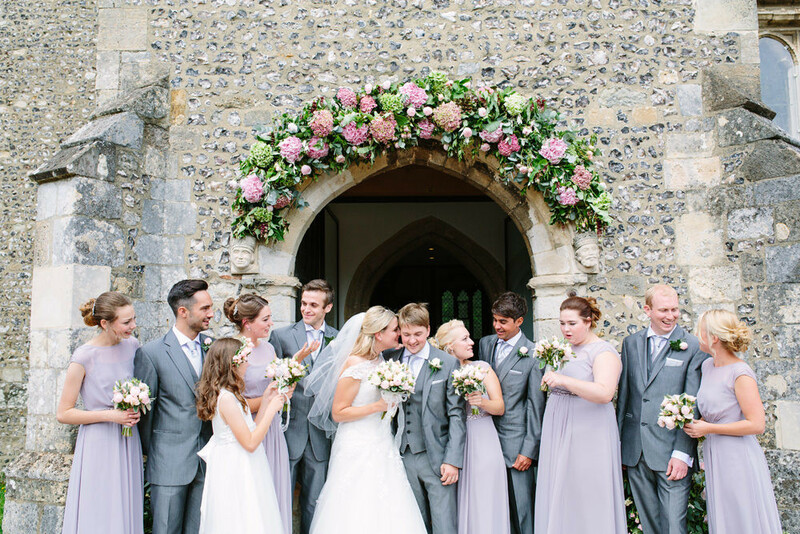 For our colour scheme we wanted to incorporate bright and bold pinks, purples and greys. We were lucky as the house is so gorgeous it needed minimal decoration. Overall we wanted it to be a fun and relaxed day. Getting married in October we had planned for rain so we couldn’t have been more delighted by the tropical weather that meant we were able to enjoy drinks and games on the lawn of the house – the perfect topping to the day! My dress was from Swoon in West Byfleet and was called Staycie by Maggie Sottero. We got married just three months after we got engaged (the venue had a free date so we thought we’d go for it!) and a lot of the wedding dress shops I contacted just couldn’t accommodate that turn around. After trawling Google I found Swoon who specialise in sample and once worn dresses – I also couldn’t help but notice that they were a fraction of the price of most other places too, which was good for the budget! I made an appointment and headed there with a close friend and my Mum – I must have tried on 15 dresses and we quickly narrowed it down to 2. After another try on of each it was obvious which one to go for – I loved the bow, the brooch, the contrast hem and its simple elegance, plus the length and size were basically perfect – it was if it was meant to be! 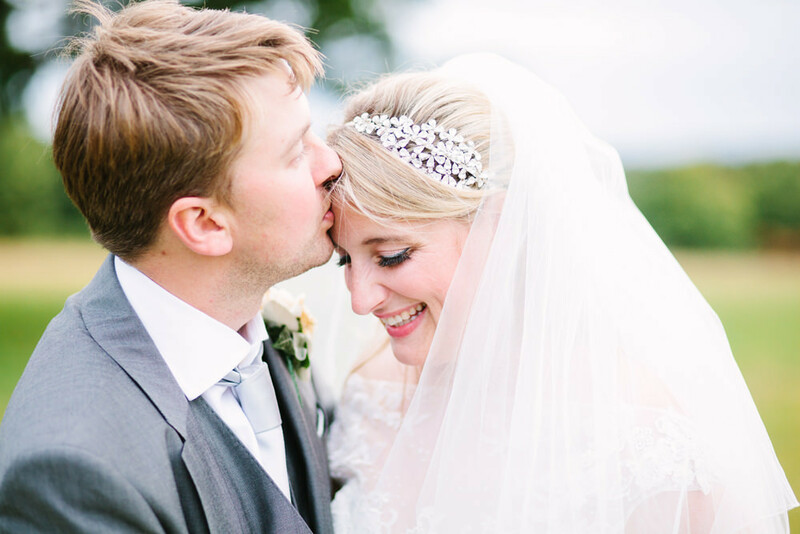 I loved loved loved my tiara the moment I saw it on the internet – it was from Blossom Wedding Day Jewellery specialists. I knew I wanted my hair in a simple style and I always part it to the side so having something that sat off-centre seemed perfect. There were so many to choose from but it had to be slightly contemporary and angled to match the brooch on my dress rather than flowery. As soon as I saw it I knew it was perfect and it didn’t disappoint when it arrived – I loved it so much I used to come home from work and try it on almost daily! My other jewellery included pieces that Kevin had given to me as presents (one of which was my something blue) and a gorgeous bracelet that he asked a friend to give me on the day (very romantic and something new!). My veil was (my something!) borrowed from Rebecca and worked perfectly as it wasn’t too long and had just a smattering of sparkles to pick up the light. My shoes were bright pink pointed courts from Office (my little sister also kindly bought them for my birthday). I love points and being bright pink they perfectly matched they day, I also loved the idea of wearing them again (which I have twice and each time brings back such lovely memories) so they are perfect in every way. Inside my shoe was a sixpence that my friend Michelle lent me… that was my something old. I had a simple bun style hair do, done at my local hairdressers Madeline House Hair. They did an amazing job and it barely moved out of place all day – the most important thing was that I still looked like me, hence not wanting anything too fussy and this also translated into the make up which I did myself. To be honest I hadn’t decided what makeup I would wear until I started doing it but I was pretty happy with the result of smokey eyes but generally pretty understated. We bought the flowers from an excellent local wholesaler Nursery Fresh and then my big sister, my Mum and Kevin’s Mum all worked to make some amazing arrangements, buttonholes and bouquets. I love Gerbera’s (don’t they just look happy?!) so we combined them with bright pink (“purple power”) and light pink (“heaven”) Roses, purple Veronica and purple Lisianthus all with grey/green foliage. For vases I headed to Ikea and got everything for under £50 – they looked great and I now have enough vases for many years to come! 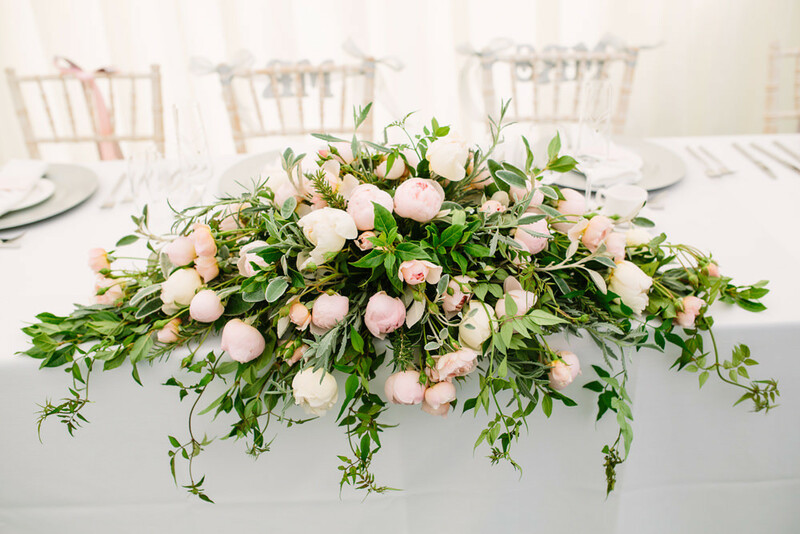 The buttonholes were very simple bright pink Roses, our flower girl carried Roses and Gerberas and my bouquet was a loose assortment of Roses, Lisianthus and Veronica and I was so pleased with how it all looked. For my best woman Zoe we found the perfect dress in Karen Millen that was a mix of greys and she was able to find some fabulous accessories. My very pretty niece was my flower girl and she wore a party dress from Monsoon – for both the girls I wanted to get something they could wear again rather than just gather dust in the wardrobe. Kevin’s best man Colin was able to find a suit that matched perfectly, we also kitted out both our Dad’s in purple ties and the boys had bright pink ties – we were after continuity rather than everything matching! Kevin looked amazing in a tailored Gieves and Hawkes three-piece suit; the grey made his blue eyes sparkle and looked great with the pink tie. It was the only suit he tried on but as soon as he was wearing it we knew it was perfect – I hadn’t seen the complete outfit till the day so I got to have a (lovely!) surprise too! Our amazing photographer was the wonderful Andy Squires. Our first attempt to find a photographer had been a disaster with a capital D, meeting with an old school, staid and very traditional wedding photographer. 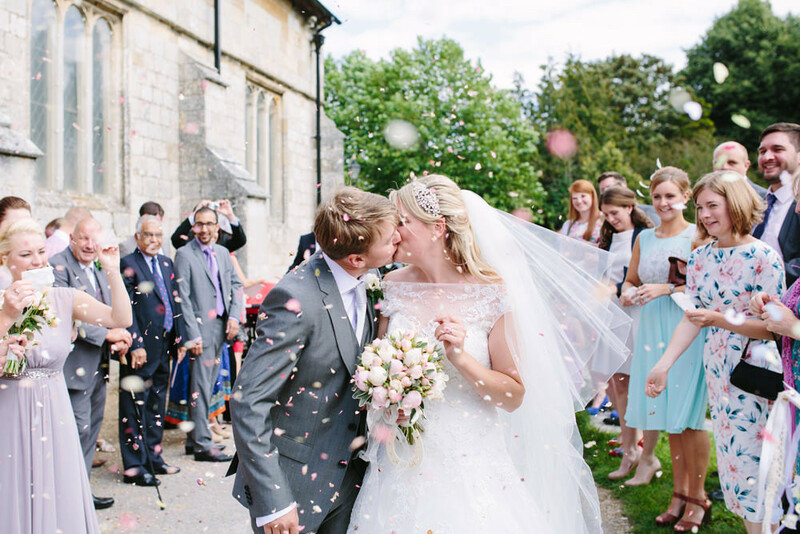 As soon as we got back from that meeting I hit the internet searching for someone friendly and relaxed who also took excellent photographs – it was quickly clear that Andy ticked all the boxes, his photos are truly individual, capturing wonderful details of the day. After being a bit sceptical and with a bit of gentle encouragement from Andy, I’m delighted that we had an engagement shoot – it was a great chance to meet Andy and talk through thoughts and ideas and made me feel much more relaxed in front of the camera on the day. When the wedding photos arrived we couldn’t have been more pleased – they are an amazing way to remember the big moments and the small details. He caught so many things that could be easily missed. On the day itself he must have been running round all over the place but he made it seem effortless. We also loved that we were able to go off for a wander and have some pictures of the two of us on our own – one of our favourite parts of the day. Our cake was amazing! We are both chocolate fiends and love Montezuma’s chocolate company. We originally looked on their website for wedding favours – but as soon as Kevin saw the cake he was sold and I didn’t need any persuading! It was an amazing combination of chocolate, fruit and nut cake with a Belgian chocolate sponge cake, all covered in gorgeous ganache and swirls of white, milk and plain truffles – the tasting session was heaven! We were also able to use it for our pudding and still have a stack left in the freezer!! During the drinks reception we hired the lovely Ingrid Dixon to play the amazing grand piano that they have at Hill Place. Our evening entertainment was the fabulous Alan Cross. Alan is an amazing swing singer and had us all up on our feet dancing the night away – at one point there were people dancing in the driveway, the hall and out on the back lawn so he was certainly doing something right! We were able to keep him a surprise from nearly all our guests until he ran up the stairs to sing our first dance – although the second song was possibly more impressive as it was a swing version of the Spiderman theme and very good too! Our first dance was dictated by the style that Alan sings, as we don’t really have ‘a song’. But with his help we decided on ‘How Sweet It Is To Be Loved By You’ and it was perfect. For favours we gave little packets of seeds from Cox & Cox that I hope everyone remembers to plant! We thought it was a nice way to get people to remember the day especially as we love growing our own fruit and veg. Our table plan was a huge effort but well worth it! Instead of the traditional we printed a picture of each guest, on Moo MiniCards, that we stuck onto an envelope. Then inside there was a card telling them which table they were sitting on and a personal message from us to them. This was then hung by ribbon from a frame that my Dad very cleverly made for us. The guests then had to identify their envelop amongst the others… they had to “find their face, to find their place”! We also included a postcard that we asked them to write a message on instead of having a guestbook. This was one of my favourite things we did – each message is so individual (I always find that guest book messages can be quite ‘samey’) and some people decided to post them to us after the day which meant we had some lovely surprises to read when we got back from honeymoon! My brother is an amazing artist and he also drew a picture where people could write a message – it is just fantastic and so personal, its currently being framed and I cant wait to get it back and put it on the wall. For name places we set up scrabble tiles, took a photo and had them printed on MiniCards by the wonderful people at Moo. They looked brilliant and were a nice keepsake for people – they also matched the scrabble cufflinks that the boys wore! Our table name places were postcards depicting covers of our favourite books that we read as children. In the evening we used the hallway as the main dance area – it was totally transformed with fairy lights running up the stairs and a glitter ball – I think every wedding should have one! To remember the people that couldn’t be with us we lit a candle and wrote a message – it was an understated but effective way of keeping them in our thoughts. Our wedding was special because of the people. Fabulous friends and family, who helped everything go without a hitch, surrounded us. Will and Rebecca have an amazing team at Hill Place which meant that nothing was stressful – a special mention must go to the amazing Ann who noticed with seconds to spare that my bouquet was still in water in the cellar. As the entrance music had already started she ran down and up 4 flights of stairs to get it to me on time and then was even able to make sure my dress was looking its best for the big entrance, amazing! 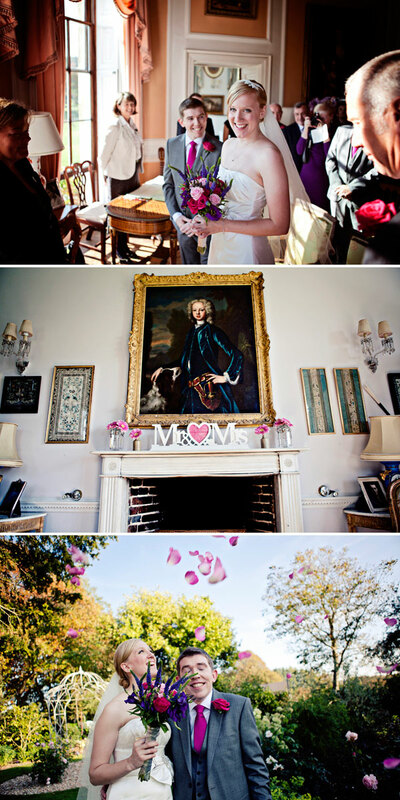 We also had the use of a great wedding planner, Marie at Isabella Weddings. I think some people worry about the expense or image of having a wedding planner but she was worth her weight in gold for us. Planning a wedding in 3 months wasn’t always easy but she was always at the end of the phone or email with support, advice, ideas or potential suppliers and on the day she was there to make sure everything was seamless and that I never had to do or worry about anything – nothing was too much trouble. For us it also meant that Will and Rebecca could relax and enjoy the day without having to play host so it worked perfectly and I would highly recommend her to other brides! 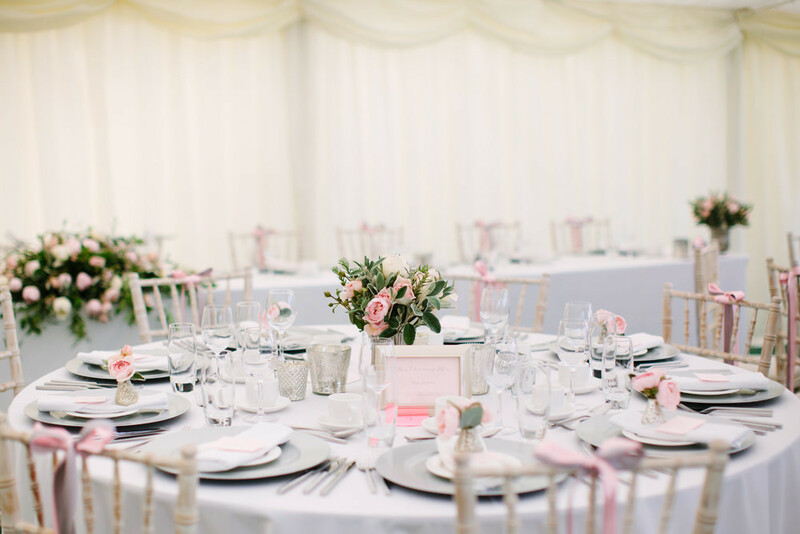 As far as advice for other brides go don’t be afraid to rip up the rulebook if you want to! Your wedding should be about you and what you want – we had what could be considered a fairly traditional day but had lots of touches that made it unique to us. Above all enjoy it and remember that you’re with friends and family and everyone is set to have a wonderful day. I loved every moment but the ceremony was so special- we chose really individual readings that mean a lot to us. The love and sentiment during that time is what really underpinned the day, there was barely a dry eye in the house! Ok, I’m finished with sulking. Actually who am I kidding? How can you be mad at Kevin and Victoria, one of the smiliest couples of the century. Looks like they had a perfect day their way. And in just three months. Wow. If you are on a timeframe like Kevin and Victoria, then you can never underestimate the powers of a decent wedding planner. It will certainly relieve a lot of the pressure both in the run up and on the day its self. A lot of people see a planner as an extravagance, but it might just be a good way of holding on to your sanity!